It is fine to take a look at the work as you walk by. But if you linger for a bit, at least say hello or ask, “do you mind if I watch?” And if you want to take a photo of the artist and the work, you’re actually taking a photo of an original copyrighted piece of artwork. So at least be polite and ask. “Photo okay?” translates in most languages, especially with hand gestures. Also, it’s rather awkward and distracting to have people look over your shoulder while you work, so the least you can do is be cordial. I’ve had several people hang around watching me who haven’t even said “bon jour” or responded when I finally said it to them. One guy just stared at me blankly after I said hello, and said nothing. And I’ve also had several take pictures of me and the work without asking. I realize I’m painting in a public place, but does that mean manners don’t apply? Les Tuilleries. 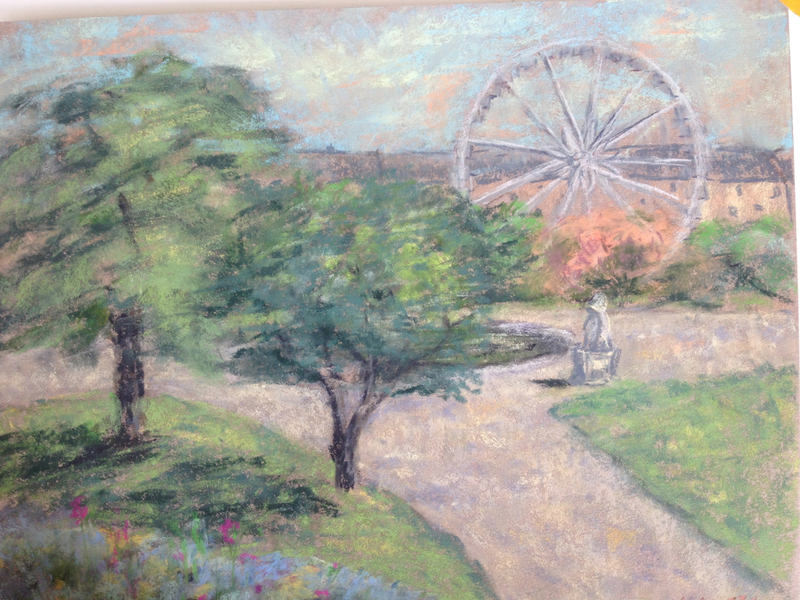 The Ferris wheel was calling me to paint it! Here’s the plein air painting I did today at Les Tuilleries. I’ve only been painting about a year, and I’ve only ever done a handful of landscapes, so I’m rather pleased by it (I usually do portraits). The reflecting pool could be better, though, and now that I look at it, maybe I should put some people in for scale. A very nice man stopped by while I was painting, did a quick critique of the composition and the colors, and told me he loved it, :). Soft pastel on sandpaper, 11×14. A La Tour Eiffel Cafe Bistro, Thibault, and a fun night in the 15th.